Ho Chi Minh City on April 16. The contest was held by the Centre of Hands-on Action and Networking for Growth and Environment (CHANGE) and 350.org – a nonprofit organisation – with sponsorship of the German Consulate General in Ho Chi Minh City and support of the municipal Department of Natural Resources and Environment. The organisation board selected the best 11 of more than 700 entries sent to the contest, comprising a first prize, two second prizes, three third prizes and five consolation prizes. 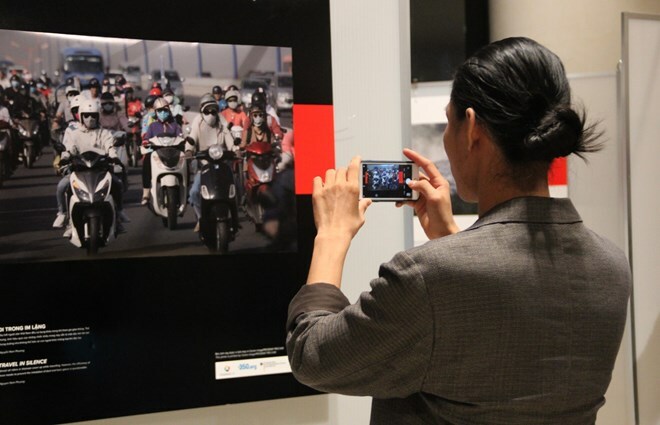 The winning works, together with 23 other outstanding photos, will be displayed at an exhibition in HCM City’s district 1 from April 17-28. After the exhibition, they will be introduced at five other venues in the city. Addressing the ceremony, German Deputy Consul General in HCM City Daniela Scheetz said in 2015, 3.5 billion people in cities worldwide breathed unsafe air, and about 4 million died due to air pollution-related causes. She cited the 11th of 17 sustainable development goals (SDG) set by the the United Nations, which calls for international efforts in building sustainable cities and communities by working for clean and pure air.